Fairmont Hot Springs is in the Rocky Mountain Trench on Highway 93 and 95, between the towns of Canal Flats and Windermere. The city of Cranbrook is 112 km (69 km.) south and Golden is 148 km (92 mi.) north. Fairmont Hot Springs, located in the BC Rockies, is a popular recreational spot with young and old alike. Fairmont with the largest odourless hot pools in Canada is an ideal place to relax and enjoy some of the most magnificent scenery in British Columbia, including Windermere Lake and the Columbia River. The soothing waters of Fairmont Hot Springs, coupled with world class golfing and outdoor splendour have made this one of BC's foremost holiday destinations. 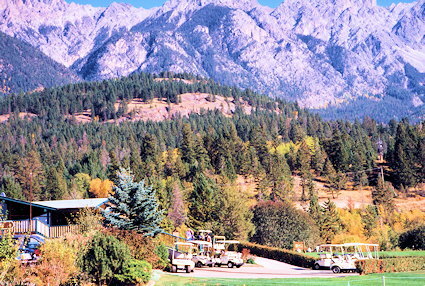 Located 112 km (69 miles) north of Cranbrook, on Hwy 93/95, Fairmont Hot Springs offers a wide range of accommodations and first rate recreational facilities. Four season activities include hot pools and spa, golfing, hiking, swimming, boating, biking, horseback riding, fishing, heli-sightseeing, downhill and cross country skiing.